This is the third cover I've designed for the Ranger in Time series. 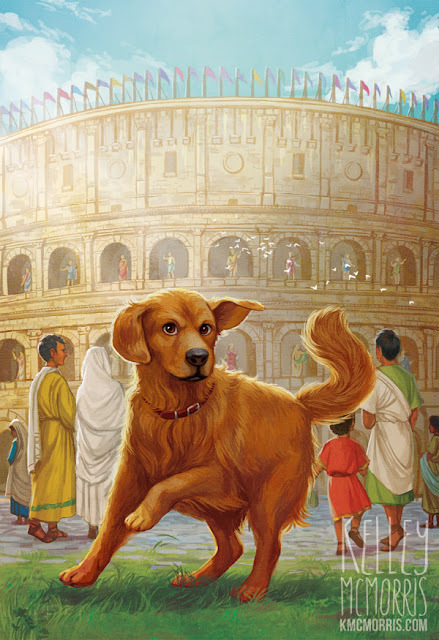 In the previous books Ranger has traveled back in time to the Oregon Trail and to Ancient Rome. 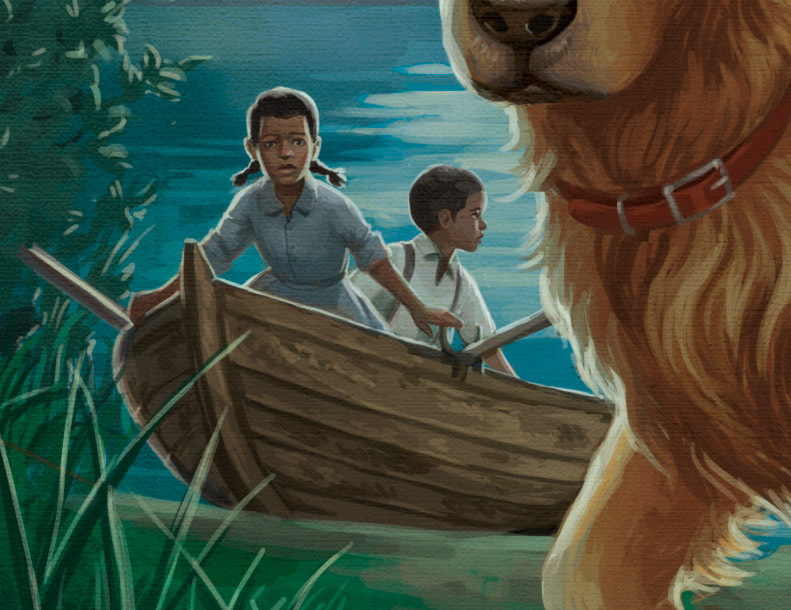 This time he was going to travel the Underground Railroad, helping two runaway slave children. Ranger will be running through the woods at nighttime along the river shore. In the distance (perhaps across the river) we can see the main plantation house Ranger is running away from. Other elements that should be included are a rowboat at the shore and the north star in the sky. 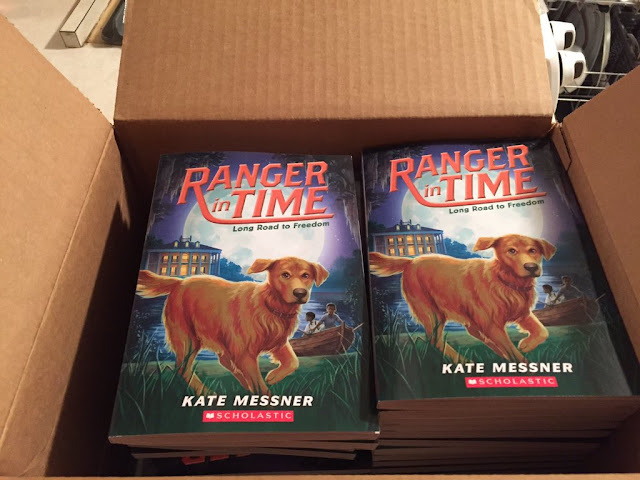 By the point Scholastic and I have a pretty established "look" for Ranger in Time covers. 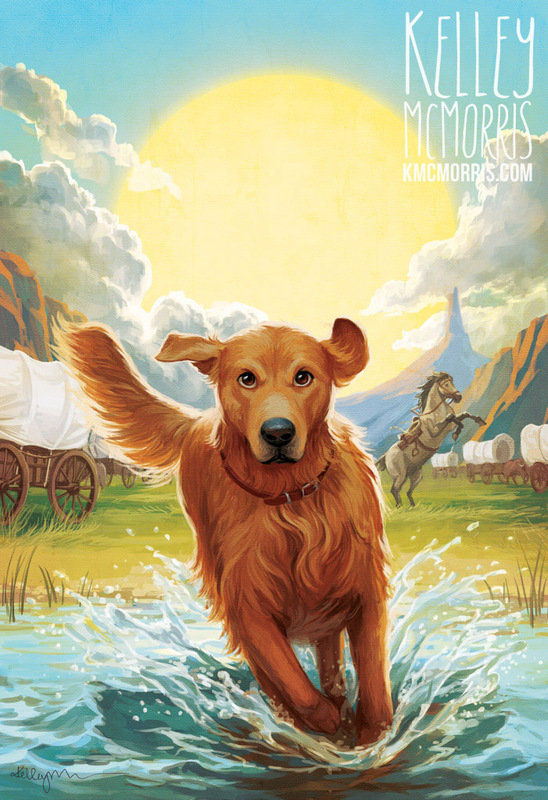 Ranger is always shown in the center running towards the reader with a look of intense determination. The background should establish the historical setting, and look exciting with vivid colors. The first cover also had an oversized sun in the background, so I took the opportunity to throw a gigantic moon in some of the roughs. I designed these three roughs and sent them to Scholastic. The team decided that they liked #3 the best, but wanted to include the two main characters, Jesse and Sarah, in a boat at the shore. 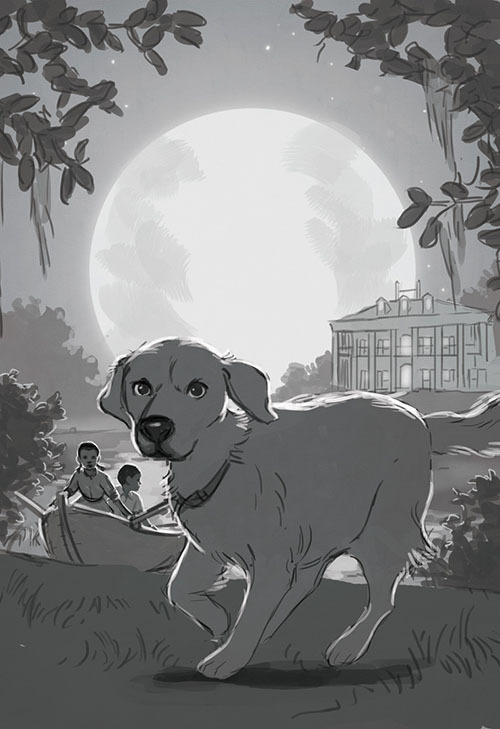 Amazingly, Scholastic approved this rough with no more revisions, and they even waived the color rough stage and told me to go straight to final! 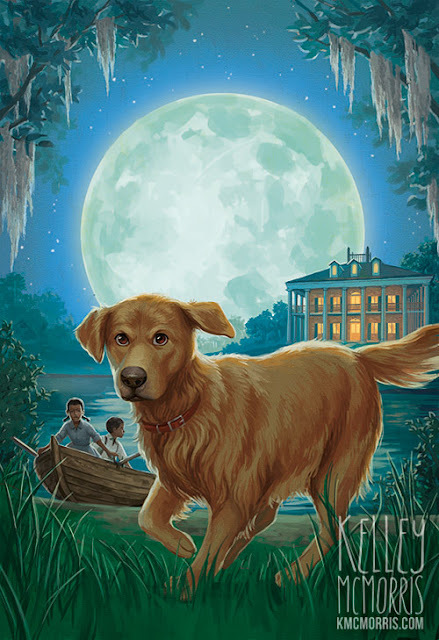 I struggled a little bit with the colors, as the scene is supposed to be lit by moonlight, but I've learned that Scholastic likes super-duper saturated cover illustrations. So I gave the moon a bright green color, and exaggerated the light coming from the windows. And with that, the cover was finished! Here it is with the rest of the cover designed by Ellen Duda. As you can see, Scholastic pumped up the saturation quite a bit more. They're saturation fiends, I tell you. Ranger in Time: The Long Road to Freedom will be available December 29th! 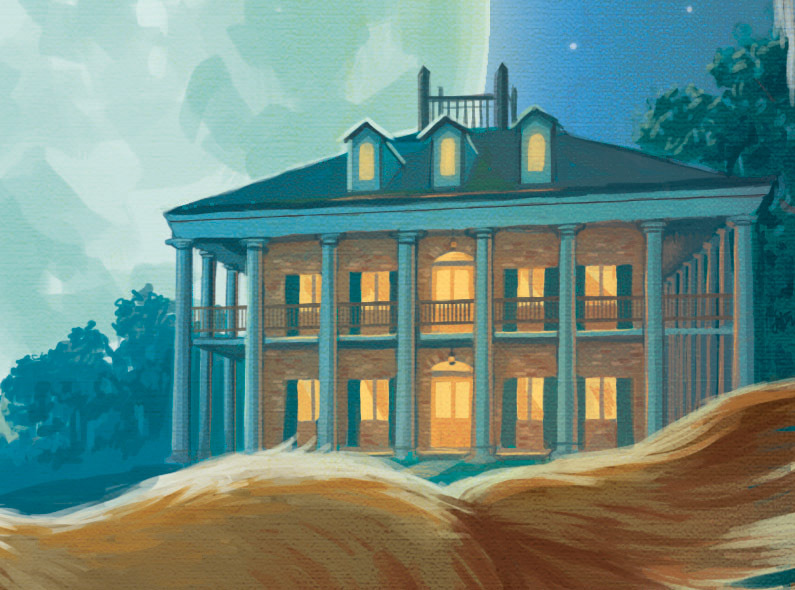 The book also features 15 interior illustrations by yours truly, which I will talk about in my next blog post. They flipped the cover on you! Was that a surprise and did you have any reservations about that? 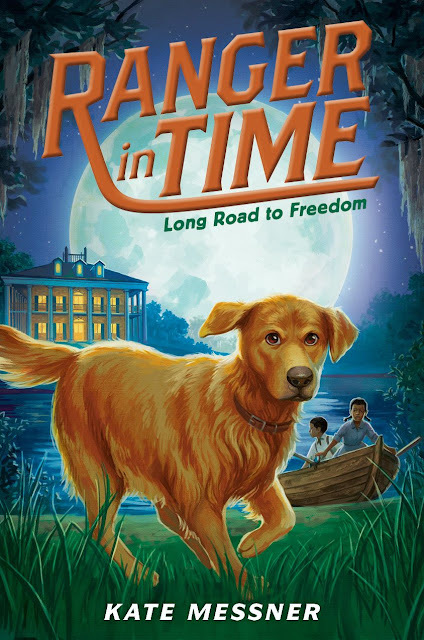 Also how many times can you portray a dog "running towards the reader with a look of intense determination" before eventually running out of ideas?! haha What are you doing (and will do) to keep coming up with action poses like that? It's fine with me if they flip the cover. Probably they just didn't want Ranger facing the same direction as he did in the previous cover. As for running out of ideas....luckily there are lots of poses of dogs running online. I recently discovered that photos of sled dogs contain lots of great action poses. But yeah it is a challenge not to make the poses too repetitive. I liked the piece on its own before they cranked up the saturation, but the saturation does work well with the title. The flip also works with the title. I love how mysterious this cover is compared to the first book! Lovely work, congratulations! It was cool to point out the first two covers to my husband at our kids' Scholastic book fair last month. You'll be happy to hear the Ranger titles were faced out on little easels on the top of the top shelf. That's about the best selling spot – perfect eye level for its readers and attention-grabbing for their parents. Congrats.